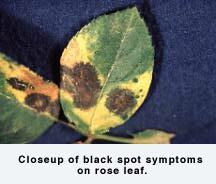 Black spot is the most important infectious disease of roses. It occurs only on roses (Rosa spp. ), and is widespread among rose species and cultivars, although some of the shrub roses and rugosa roses show more resistance. Many hybrid tea roses are very susceptible. Lists of black spot-resistance hybrid tea roses often are variable due to localized races of the pathogen. Round to irregular black splotches with fringed margins are quite obvious, mostly on upper leaf surfaces. Leaf yellowing develops around these black spots, with defoliation of these infected leaves common. Repeated defoliation weakens plants, leading to poorer blooming and greater sensitivity to other stresses. Occasionally symptoms are noted on petals (red dots, distortions), and on petioles, fruit and canes. Using a hand lens, the fungus can often be seen fruiting in the black spots. The fungus overwinters on fallen leaves and diseased canes. Microscopic spores are then splashed to newly emerged leaves and stem tissue in the spring. Under ideal conditions of leaf wetness, humidity and temperature the spores can germinate and infect in 1 day, cause symptoms in 4 to 5 days, and produce new spores that can infect additional leaf, flower and cane tissue within 10 to 11 days. Spores are easily spread to new locations by air currents. Keep foliage dry. Plant roses in sunny locations to encourage drying after rains. Avoid sites with dense surrounding vegetation, so that good air movement will dry leaves. Avoid overhead irrigation, especially late in the day. Black spot is most severe in summers with sustained rainy periods. Sanitation. Remove all black spotted leaves from and around plants. This should be done throughout the season. Before winter, remove and clean up all diseased leaves and remove diseased canes where possible. Disease resistance. Listing susceptibility and resistance of all roses would take volumes. In addition, the occurrence of local races of the pathogen often result in a particular cultivar being listed as susceptible in one area and resistant in another. However, some lists have general usefulness; see Table 1. Also, consult local Extension publications and books, consult local rosarians and garden center horticulturists, and make observations of relative disease incidence in local rose collections and your own gardens. Preventive fungicide applications. Fungicide controls are not successful if cultural and sanitation practices listed above are not followed. For fungicides to work, applications must be made preventively, providing a protective fungicide barrier which kills germinating fungal spores that have landed on plant tissue. If conditions for infection are present and a high level of control is desired, preventive spray programs often start as soon as rose foliage emerges in the spring and continue throughout the summer at frequent intervals (as frequently as every 7 to 10 days in wet weather). Frequently used fungicides for black spot control include triforine (Funginex), and phaltan. Table 1. 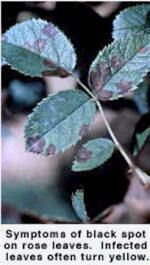 Rose varieties reported to have resistance to black spot.